Very good lessons.The lesson increased my understanding of the topics presented. Extremely useful.last water year was drought year which is a historical event.since after 144 years acute drought year is yester year.now i gained some knowledge about Drought,IOD,VI,SST,ESON etc.,Thank you all. Extremely useful,since last water year was drought year,which is a historical event since same kind of acute drought was met before 144 years.now gained basic knowledge to assess drought.Thank you all. 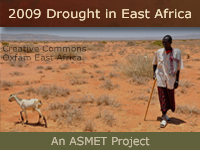 Describe the typical rainfall pattern in the Greater Horn of Africa. Identify products from satellites and other sources that are useful for monitoring and predicting drought in the GHA. Describe the advantages and limitations of these products and why they may produce different results. Use satellite-based and other products to monitor and predict drought in the GHA. Describe vegetation indices and use them to monitor the health and amount of vegetation. Use MSG microphysics and natural color RGBs to identify and monitor conditions conducive to drought formation. Identify phases of climate oscillations that affect rainfall performance in the Greater Horn of Africa. Use sea surface temperature products to identify climate phases that may impact drought in the GHA.